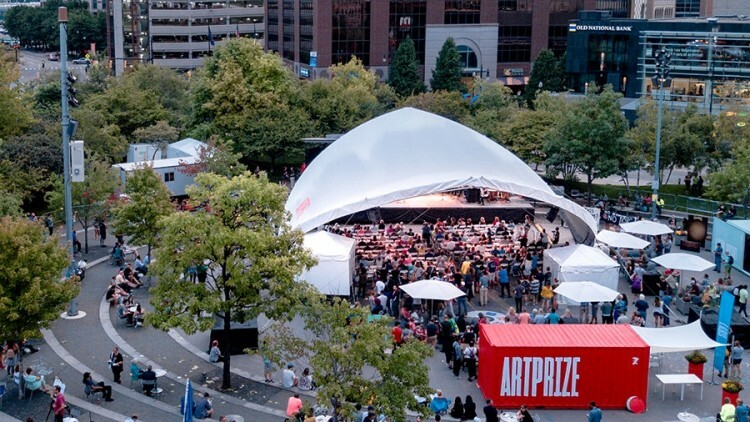 GRAND RAPIDS (Mich.) SEPTEMBER 24, 2018 — ArtPrize, the international art competition recognized as one of the world’s largest annual public art events, tonight hosted the seventh annual Jurors’ Shortlist Event—kicking off the ArtPrize Studio Series, powered by ITC, Your Energy Superhighway. Four ArtPrize 10 category award jurors revealed their shortlists of five artist entries in the categories of 2D, 3D, Installation and Time-Based. These twenty finalists will join the twenty public vote finalists, to be announced on September 30, and will be in the running for $500,000 in prizes — including two $200,000 Grand Prizes and $100,000 in Category Awards. A fifth category award juror selected five ArtPrize venues to compete for the $12,500 Outstanding Venue juried award. The juried category award and Grand Prize winners will be announced at the Tenth Annual ArtPrize Awards on October 5 — broadcast live on local NBC affiliate, WOOD TV8. The $200,000 Juried Grand Prize will be decided by a panel of three jurors including Brooke Davis Anderson, Edna S. Tuttleman Director at the Museum at PAFA; Lauren Haynes, Curator of Contemporary Art at Crystal Bridges Museum of Contemporary Art; and Ran Ortner, Artist, $250,000 Winner of ArtPrize 2009. The $500,000 in cash prizes is awarded equally by public vote and expert jury through two rounds. The first round narrows the field of 1,263 artist entries, representing 40 countries and 41 US states, installed at 168 venues throughout Grand Rapids to a set of up to forty finalists — twenty decided by public vote and twenty by expert jury. Round 1 Voting, during which the public may vote for as many artists as they choose to determine the Public Vote Final 20, will continue until September 29 at 11:59 p.m. ET.